Lake Vostok is the largest sub-glacial lake in Antarctica. The primary source of our current knowledge regarding the geochemistry and biology of the lake comes from the analysis of refrozen lake water associated with ice core drilling. Several sources of dissolved ions and particulate matter to the lake have been proposed, including materials from the melted glacier ice, the weathering of underlying geological materials, hydrothermal activity and underlying, ancient evaporitic deposits. A sample of Lake Vostok Type 1 accretion ice has been analyzed for its 87Sr/86Sr signature as well as its major cation and anion and Sr concentrations. 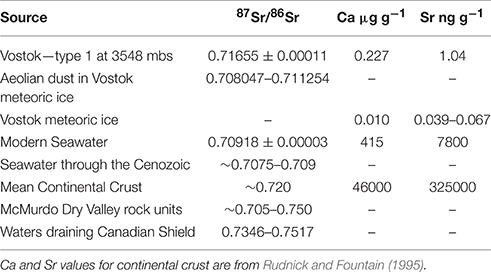 The strontium isotope ratio of 0.71655 and the Ca/Sr ratio in the sample strongly indicate that the major source of the Sr is from aluminosilicate minerals from the continental crust. These data imply that at least a portion of the other cations in the Type 1 ice also are derived from continental crustal materials and not hydrothermal activity, the melted glacier ice, or evaporitic sources. Currently close to 400 individual lakes have been documented under the Antarctic ice sheets, with both “static” and hydrologically active, flow-through, lake types having been defined (Smith et al., 2009; Wright and Siegert, 2012). Lake Vostok lies between 76° and 79°S and 100° to 107°E and has been a source of great interest since the documentation of its depth by Kapitsa et al. (1996). Lake Vostok at ~260 km length and 50 km width is the largest of the subglacial lakes. The lake has a water depth of greater than 500 m and it lies beneath ~4 km of ice (Siegert et al., 2011). The estimates for the age of the lake suggest it may have been in existence for ~14 Ma, while the age of the water is estimated to be ~1 Ma (Siegert et al., 2011). Drilling of the Vostok ice core recovered over 200 m of accreted lake water beneath glacier ice of meteoric origin (Jouzel et al., 1999). Further work ascertained that there are two distinct types of accretion ice (Type 1 and Type 2), with Type 1 containing abundant particulate matter, or “inclusions” (3539–3609 m in depth), and the deeper, Type 2 ice, closer to the present day lake level (3610–3623 m in depth) being absent of particulates (De Angelis et al., 2004). De Angelis et al. (2004) argued that the Type 1 ice formed from lake water in a shallow embayment with erodible lake sediments, while the Type 2 ice was produced in deeper portions of the lake where sediment access was minimal. Few attempts have been made to directly sample subglacial environments in Antarctica and accretion ice from Lake Vostok offers a glimpse into biogeochemical processes occurring beneath the Antarctic ice sheet (Wadham et al., 2010). Since the initial discovery of the lake accretion ice, numerous investigators have analyzed pieces/sections of this accretion ice for its biological, biogeochemical, geochemical, and mineralogical characteristics (e.g., Priscu et al., 1999; Souchez et al., 2000; Simones et al., 2002; Royston-Bishop et al., 2005; Bulat et al., 2009; Leitchenkov et al., 2015). Recent work also includes the analysis of refrozen lake water and the particulates associated with it (Leitchenkov et al., 2015; Lipenkov et al., 2015). Because the lake waters have still not been sampled directly, the chemistry of the lake, and the processes controlling it, still have to be inferred from analysis of accretion ice. Yet in order to accomplish this, assumptions regarding salt rejection/partitioning during ice formation, the nature of the underlying geochemistry and processes controlling it, the long-term variation in the size of the lake, and other issues have to be considered (Siegert et al., 2011). Because of these many unknowns, differing interpretations of the accretion ice geochemical/mineralogical data have been made (Laybourn-Parry and Wadham, 2014). For example, there has been a rigorous debate over the roles of hydrothermal influence of the lake waters, chemical weathering and hydrolysis of the lake basin materials, in-situ particle weathering, and the dissolution of evaporitic materials as sources of major solutes to the lake waters (Jean-Baptiste et al., 2001; Souchez et al., 2003; De Angelis et al., 2004). In addition, it is currently unclear if the particulates found in the Type 1 accretion ice are from locations within the lake basin or from melt-out from the glacier ice (Souchez et al., 2000; Royston-Bishop et al., 2005). Christner et al. (2006) predicted from the analysis of the accretion ice, a range of total dissolved major ions (TDS) in the lake water, ranging from ~50 mM in the shallow embayment to as little as ~2 mM for the deeper portions of the lake. This contrasts to previous estimates of embayment water concentrations of ~2 mM by Priscu et al. (1999) and Siegert et al. (2003). Clearly after more than 15 years from the time that the original papers on the accretion ice analyses were published, there is no consensus on either the composition of the lake waters, or the source of the particulate material in the ice. Besides the potential of sampling the lake water directly, other approaches are needed to assess the geochemistry of the lake. In this paper, we present strontium isotope data from a sample of Type 1 accretion ice in order to provide new insight into the source of the solutes in the lake waters, and hence better constrain the processes controlling the geochemistry/mineralogy of the system. A sample from 3548 m depth, which is considered to be Type 1 accretion ice (De Angelis et al., 2004) was processed under clean conditions at Montana State University using the techniques described by Christner et al. (2006). After cleaning the sample, it was placed into a pre-cleaned Teflon container and transported to The Ohio State University. The processing at OSU was done in a Class 100, positive pressure clean hood where the melted ice sample was filtered through a 0.4 μm Nuclepore membrane filter. One aliquot of the filtrate was analyzed for major cations and anions using a Dionex Ion Chromatograph following the methods of Welch et al. (2010), although a large ~350 μl sample loop was used to improve the method sensitivity. The precision of the major ion measurements determined by difference of the duplicate analysis was < 1% for all analytes except for Ca2+, which was 2%. Another aliquot was processed in a Class 100 clean room where sub-samples were spiked with 84Sr for Sr isotope ratio measurements. Sr was isolated by chromatography with total blank levels of < 1%. The sub-aliquots (5 of varying volume) gave analytically indistinguishable results, with the mean of the two most reliable analyses yielding a 87Sr/86Sr ratio of 0.71655 ± 0.00011, and a total dissolved Sr concentration of 1.036 ± 0.005 μg kg−1. All the data are shown in Tables 1, 2. Table 1. Comparison of 87Sr/86Sr and Sr and Ca concentrations of Lake Vostok Type 1 accretion ice (this work) with selected materials summarized from the text. Table 2. Cation and Cl− concentrations measured in Vostok accretion ice sample 3548 m.
The 87Sr/86Sr ratio in the Type 1 accretion ice is interpreted to represent the Sr isotopic signature of the lake water from which it froze. The measured Ca/Sr mass ratio in the filtered accretion ice is 219 (Table 1). Dissolved ion concentrations in the ice may be greatly influenced by differences in their respective partition coefficients. For example, experiments in solute-poor solutions have demonstrated that partitioning of divalent ions into the ice is related to ionic size with Ca2+ being ~3x > Sr2+ (Killawee et al., 1998) with a range of 1.5 to 5 based on the uncertainty in the experimental results. Given this difference in the experimental segregation coefficients of Killawee et al. (1998) the Ca/Sr mass ratio in the lake water is estimated to be ~70 with a range of ~44 to 146 based on the uncertainty of the partition coefficients. Using the Ca data from De Angelis et al. (2004) and the Sr data from Gabrielli et al. (2005) from the lowest meteoric sections of the Vostok ice core, a mean Ca/Sr mass ratio of ~190 is obtained. The comparison of these data suggests an influx of Sr to the lake from another source than simply the melting of glacier ice. Analysis of aeolian “dust” from the Vostok ice core itself yielded 87Sr/86Sr values in the range of 0.708047–0.711254 (Basile et al., 1997; Delmonte et al., 2004), which is clearly much less radiogenic than the value from the Type 1 accretion ice. Therefore the in-situ weathering of particulate matter within the glacial ice itself cannot be the sole missing source of Sr in the accretion ice, and hence the lake water. Gabrielli et al. (2005) demonstrated that between 20 and 40% of Sr in the Vostok ice is from a marine aerosol contribution with the higher percentage coming during the interglacial times. If we assume that 40% of the dissolved Sr in the lake water is derived from the marine source, which has a maximum 87Sr/86Sr ratio of 0.7092, the other 60% of the Sr would have to have a ratio of ≈ 0.72150. This value would be less radiogenic, if the contribution of the marine source were lower; i.e. at 20%, the missing Sr source would have a ratio of ≈ 0.718. Lake Vostok is thought to have been in existence since the ice sheet has been at a continental scale, at least 14 million years (Siegert et al., 2001). The marine 87Sr/86Sr isotopic ratio has varied over this time, ranging from ~0.708 to ~0.709 (McArthur and Howarth, 2004), however it has never been higher than the modern value. Therefore, our calculation is based on the maximum value for the 87Sr/86Sr composition of seawater. A more radiogenic source of Sr is needed to explain the Sr isotopic ratio obtained from the accretion ice. This more radiogenic source must come from the chemical weathering of the geologic materials within the lake basin itself. Continental crustal rocks can have a wide range of Sr isotopic composition (Faure and Powell, 1972). For reference, 87Sr/86Sr ratios for various rock types found in the McMurdo Dry Valleys, Antarctica, range from about 0.705 to 0.750, with some mineral separates being much higher (Lyons et al., 2002). In general, felsic rocks are enriched in K+ and Rb+, and therefore, have more radiogenic 87Sr from the decay of 87Rb. The Sr isotopic composition of the lake bed lithology is not known. The major ion data also support the idea of a chemical weathering contribution for cations from the lake basin. If we assume that all of the Cl− present is from a marine source/aerosol, we can use the cation to Cl− ratio of seawater to calculate the contribution of chemical weathering for cations in the sample. This leads to concentrations from chemical weathering of 5.2 μM Na+, 0.7 μM K+, 3.5 μM Mg2+ and 5.3 μM Ca2+. The Mg/Na and Ca/Na molar ratios place this composition in the middle of values representing global large rivers (Gaillardet et al., 1999). East Antarctica is considered to be a rather stable craton that was initially formed in the Precambrian. Recent work of Leitchenkov et al. (2015) supports this notion as zircons and monazites in sedimentary rock clusters from lake ice yielded ages from 0.6 to 2.0 Ga, with two distinct clusters of 0.8–1.15 and 1.6–1.8 Ga. Geophysical investigations indicate that there is a lack of sediments overlying the basement rocks negating the idea that the basin is a Mesozoic rift as originally proposed (Leitchenkov et al., 2015). Geophysical data also suggest no current volcanism or other magmatic activity associated with the lake, and low heat flow is consistent with a crustal age of 800 Ma or older (Studinger et al., 2003). Our 87Sr/86Sr data indicate that a primary source of Sr, and perhaps other solutes to the lake, is the chemical weathering of aluminosilicate minerals within the lake basin. As a comparison to water geochemistry draining old continental craton, data from rivers draining Canadian Shield watersheds yield 87Sr/86Sr ratios of between 0.7346 and 0.7517 and Ca/Sr mass ratios of ≈ 430 to ≈ 480 (Millot et al., 2003). However, Blum and Erel (1997) have demonstrated the preferential solubilization of 87Sr in the earliest stages of the weathering of glacial deposits. Thus, we interpret the intermediate values we measured (between these Canadian Shield and seawater) to reflect the longer duration of water contact with these very old basin materials. This argument is also supported in part by the types of minerals found as “inclusions” within the Type 1 accretion ice. Christner et al. (2006) have reported biotite, potassium feldspar, plagioclase and quartz in the accretion ice and some of the biotite appeared to be glacially crushed (Priscu et al., 1999). The Sr isotopic signature derived from the dissolution of minerals such as mica could be responsible for the 87Sr/86Sr values in the Type 1 accretion ice. Anderson et al. (1997) has clearly demonstrated that watersheds that have been glaciated tend to have relatively higher dissolved Ca2+ and K+ in their drainage waters due to the grinding and preferential dissolution of calcite and biotite. The 87Sr/86Sr value clearly supports the notion that more felsic mineral components, those associated with continental crust, are a major source of Sr and probably other dissolved cations to the lake waters. These data support the idea that aluminosilicate mineral weathering is a major source of solutes to Lake Vostok waters as initially suggested by Wadham et al. (2010). It is still unclear if this weathering occurs primarily while particles are suspended in the lake, or as sediments on the lake floor, or from weathering of basement rocks. Future work should include a study of the geochemistry of the particles in the accretion ice and also the analysis of the Sr isotopes in the Type 2 accretion ice to further constrain the source of cations to the lake. WL is the lead on this study. WL, JP, and MT. conceived of the research and fundamental ideas behind it. GR and KW assisted with sample processing. KW performed ion analysis. All authors contributed ideas and assisted with writing and editing the manuscript. This work was supported by US National Science Foundation grants NSF 0085400 and NSF 0237335 to JP, and UK NERC Studentship NER/S/A/2002/10332 to GR. In addition, the Sr isotope analyses were performed in Dr. K. A. Foland's laboratory at OSU supported through NSF grant EAR-0127546. We are grateful to K. A. Foland and J. S. Linder for performing the isotope analysis. We thank all those involved with the ice core processing, cleaning, etc. especially Dr. Brent Christner. We thank three reviewers of this manuscript whose comments and guidance have greatly clarified and enhanced our prose. Anderson, S. P., Drever, J. I., and Humphrey, N. F. (1997). Chemical weathering in glacial environments. Geology 25, 399–402. Faure, G., and Powell, J. L. (1972). Strontium Isotope Geology, Vol. 5. Heidelberg; New York, NY: Springer-Verlag Berlin. Jouzel, J., Petit, J. R., Souchez, R., Barkov, N. I., Lipenkov, V. Y., Raynaud, D., et al. (1999). More than 200 meters of lake ice above subglacial Lake Vostok, Antarctica. Science 286, 2138–2141. McArthur, J. M., and Howarth, R. J. (2004). “Strontium isotope stratigraphy,” in A Geological Timescale 2004, Chapter: Strontium Isotope Stratigraphy, eds F. Gradstein J. Ogg, and A. Smith (Cambridge: Cambridge University Press), 96–105. Siegert, M. J., Popov, S., and Studinger, M. (2011). “Vostok Subglacial Lake: a review of geophysical data regarding its discovery and topographic setting,” in Antarctic Subglacial Aquatic Environments, eds M. J. Siegert, M. C. Kennicutt II and R. A. Bindschadler (Washington, DC: American Geophysical Union), 45–60. Copyright © 2016 Lyons, Welch, Priscu, Tranter and Royston-Bishop. This is an open-access article distributed under the terms of the Creative Commons Attribution License (CC BY). The use, distribution or reproduction in other forums is permitted, provided the original author(s) or licensor are credited and that the original publication in this journal is cited, in accordance with accepted academic practice. No use, distribution or reproduction is permitted which does not comply with these terms.